The ‘twist to open’ Helix product combines an ergonomically designed stopper made from cork and a glass bottle with an internal thread finish in the neck. According to companies, the product is user-friendly and resealable, and can be easily implemented into existing filling lines with only minor adjustments required. “Helix meets consumers’ growing desire for sustainability and quality, while delivering the brand building and premium image packaging wineries rely upon,” said Antonio Amorim, Chairman and CEO of Amorim. 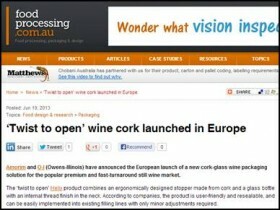 The companies reportedly conducted extensive testing in which wine packaged in Helix glass bottles with cork stoppers showed no alteration in terms of taste, aroma or colour. Market research showed good customer acceptance of Helix for fast-turnaround and popular premium wines in France, the UK, USA and China. According to the companies, consumers also appreciate that the new closure retains the festive ‘pop’ associated with opening a bottle of wine.